Why do we get such cravings for fried foods? And why, oh why do calorie gods frown upon these treats. If there was a heaven, and they didn’t count calories when I got there; this is what I will eat for breakfast every day : aloo puri. Let’s start with puri, the deep fried flatbread of north India. Mix one cup whole wheat flour with water and knead to make a stiff but pliable dough. Divide into small balls and roll into thin puris. Heat oil in a pan (actually a kadai – a deep circular pan) and let it reach the smoking point. 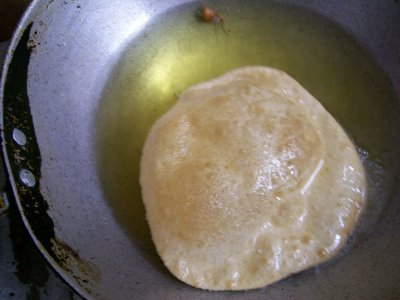 Now lower the flame and slowly slide the puri into oil. The next 10 seconds are an art only learnt over the years – you need to press the puri into oil gently and it will pop over. Turn sides and cook a few seconds until lightly browned all over. 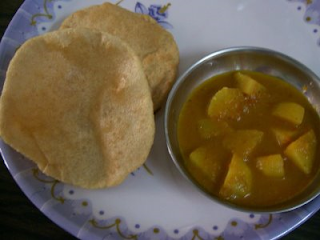 In my world, the puris can be eaten with two different accompaniments. If you are buying puris off a takeaway joint in Amritsar, they would typically come with a spicy/tangy chickpea curry. But when making them at home, aloo tamatar (curried potatoes) are the favorite pairing for puris. To make the curry, chop 2 small potatoes into sqaure pieces. Chop one onion finely, and puree a tomato. Heat ghee in a pan and sauté onions until they are soft and light brown. Add ¼ tsp turmeric powder and then the tomato puree a few seconds later – I know the traditional recipe is the other way round, but this way you take the raw flavor off turmeric. Now sauté the onion/tomato mix until the tomatoes are well cooked. Add salt, cayenne pepper and 1 cup water. Bring to a boil, then add potatoes and simmer until they are soft. Top the curry with garam masala and chopped coriander (I’d run out of it so you can’t see it in the picture!). Now bring on the puris, and let the day begin! 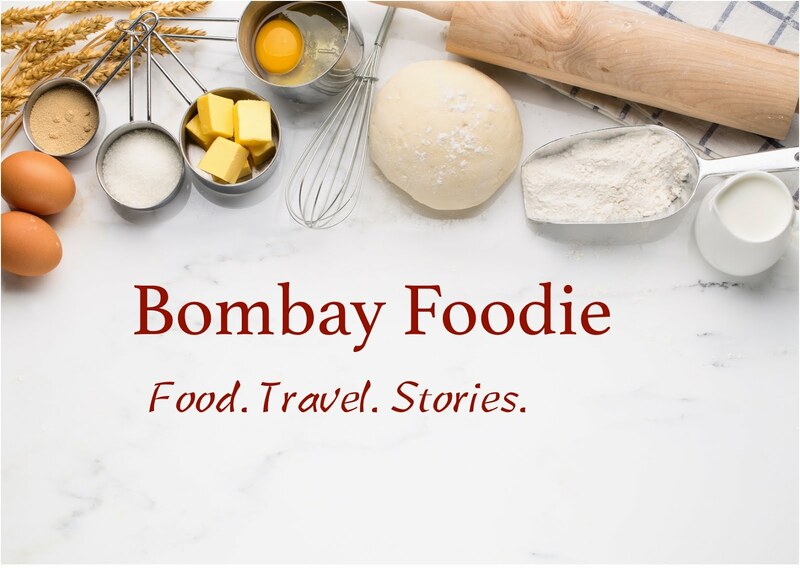 I know my recipes are short and cryptic, so get in touch if you need help or more information or just plain encouragement to try Indian food.